You may notice that many photographers base their packages on amount of time coverage. So here is a little info to help you figure out how many hours of photography you may need. The most important sections of the wedding day are; the Ceremony, Group Photos & Romantic Photos. Therefore, you can start there and build onto that what you like. 4 hours: This is perfect for Intimate Weddings & Elopements. This is typically enough time to cover the most important sections of the day including; the Ceremony, Group photos & Romantic photos. 8 hours: This is good for a smaller wedding. It can be enough photography coverage with the right amount of planning. If you get ready in separate rooms at the same hotel and have the Ceremony & Reception at the same hotel, you will save a considerable amount of time in travel. You will have to cut the Getting Ready coverage down to an hour by being mostly dressed when the photographer arrives and having only the Bridal Party and Parents in the room. As well, during the reception you will have to get straight to the Traditions of first dances, bouquet toss, garter toss, cake cutting & speeches. In this situation you will have to let the photographer(s) go before the partying starts. 14 hours: If you would like full wedding day photo coverage, it can take 12 to 14 hours if you consider that you will start to get ready shortly after you wake up in the morning and the party doesn't end until shortly before everyone goes home and goes to sleep. This allows for a more relaxed timeline during the Getting Ready photos and during the Reception. If you are getting ready in separate locations, have a large number of guests and want photos of all the dancing at the end of the night you will need this amount of wedding photography coverage. Below we have outlined the standard break down of a wedding day. Each section below typically takes around 2 hours, especially if you include travel and other normal delays that occur when you are trying to organize a large group of people. Depending on how many people are at the location and how far along you are when we arrive; we find 2 hours gives us time to cover everything, as well as allows us to keep our distance. There are many details to photograph during this time and often many photos with the parents, family and the wedding party. This gives us the ability to photograph everyone looking their best and gives you time to hangout with the friends and family. To save time, the Bride & Groom can get ready in separate rooms at the same location; such as a hotel, be half way dressed when we arrive and have a small well organized group of people. A first look is when the Bride & Groom decide to do a surprise visit with each other before the ceremony. You may find this to be an exciting idea or you may want to stick to tradition. 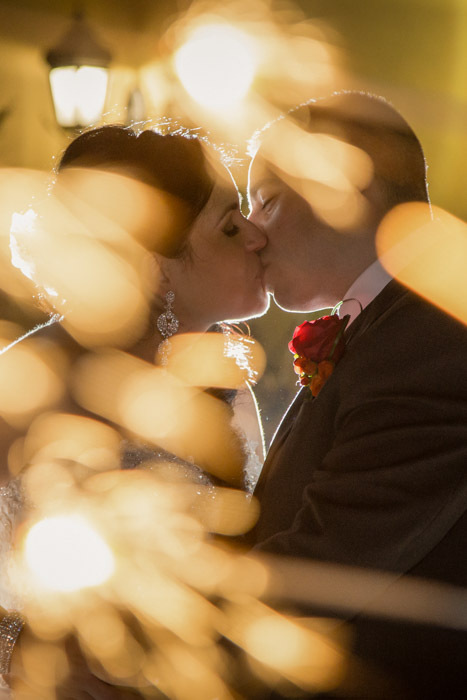 The advantages of a first look is that you can get the romantic photos done early in the day when you are fresh, as well as save time between the ceremony and reception and join your guests sooner. If you do choose to go with a first look, we recommend using the full 1-2hours here, so that you can go straight from your ceremony to your reception later. If you are planning 8 hours of coverage, you might skip the First Look or use this time in lieu of the Romantic photos later on. Many wedding ceremonies are about 30mins to 1 hour service. The receiving line can take up to 30mins. And group photos take up to 30mins. This will be your first chance to relax and gather yourself and enjoy a little time with your partner. Also, the wedding party will surely want to crack open some refreshments. Depending on the locations you have chosen, there may be some travel time and everyone has to get in the limo and out of the limo at each location. To save time , you can have photos with the wedding party right after the ceremony and send them off to entertain the guests. Then you can have your romantic photos in private at a nearby location. This section always takes longer than expected. It really does take a long time for guests to settle down and find their seats, the wedding party entrance, dinner to be served and speeches throughout. To save time, you can do the wedding party entrance, first 3 dances, bouquet toss, garter toss and cake cutting immediately (which will take about 1 hour) and let your photographer go before dinner. If you save the traditions for after dinner, they typically take a little longer. Likely you will be going by a more relaxed timeline, which may mean there will be a few more speeches, you will be socializing with guests and so on. This will typically mean about a 2 hour time frame to get all of you traditions done. To save time, you can remain diligent and get the traditions done before dinner is served. At this point it is up to you how much longer you would like the photographers to stick around. You may not want the photographers to miss a moment or you may need just a few extra photos to capture the excitement. In Camera Artistry refers to creating unique photo effects in camera without the use of Photoshop. These are 7 of my favourite photos creating filters & textures using only what was available at the location. I have included a little note about how each one was created. I hope you enjoy these and it encourages you to go out and try something new. I will create future blog posts on In Camera Artistry using; Reflections, Shadows and more... If you don't want to miss any cool tips & inspiration, subscribe to the newsletter on the About page. This image was taken at the Retro Suites Hotel. I first noticed a cool red table with a pinup girl artwork printed on the side and thought I would take a relaxed portrait of the Groom sitting and having a laugh. As I worked the composition, I noticed the reflection on the table and thought I would give it a try. 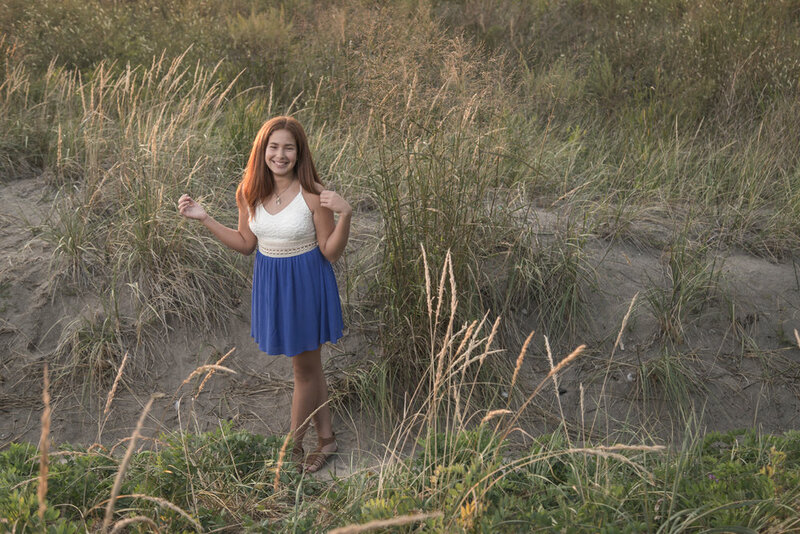 I captured this image while assisting Lens On Life Photographic Expressions in Chatham. A Brides veil is very versatile for enhancing portraits and bridal accessories. In this image I used the Bride's veil to cover the couple. I used a close crop so that the veil created a texture over the entire image. This location is Rock Glen Conservation Area. There is a broken down, 'castle like' structure there and they just happened to be hosting a wedding that day, therefore the structure was decorated with curtains on the outside over some of the window openings. I had an assistant spread out the curtain and hold it just right in front of the couple and I framed the stone wall in the back to create multiple textures. I did try focusing on the couple and the curtain and had to test various apertures to get just the right amount of blur. The image on the right shows the bottom of the curtain which does look kinda cool, but better serves as a before image. As I remember, this was the last photo of the evening. It had rained slightly on and off through the session, but nothing major, just enough for a few unique photos including this one. As we were getting ready to go, I noticed that there were raindrops on the windows of my car and I had the idea to do this photo. I had the couple sit in the back seat and had my assistant hold an LED light and sit in the front seat. It was pitch black out, so it was easy to hide the background, but I did experiment with focusing on the couple vs. the raindrops and experimented with the aperture for the right amount of out of focus blur. I liked this image the best because the raindrops make a great texture and it leaves the the couples embrace slightly out of focus. 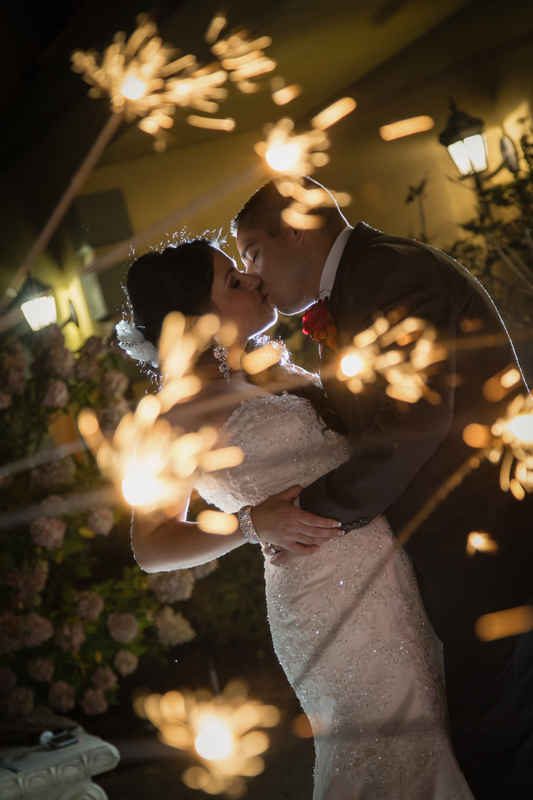 For this wedding, I actually brought sparklers with the idea of creating a unique photo. I had a few of the guests hold the sparklers close, in front of the lens. hey had no idea what I was trying to do, but they did have a lot of fun, haha. I also used a flash to back light the couple and add a little extra. 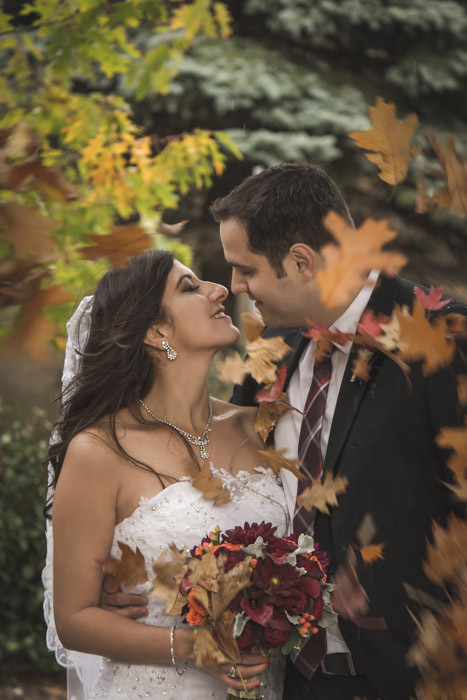 I had two people collect and toss the fall leaves into the air around the couple. Simple but fun. 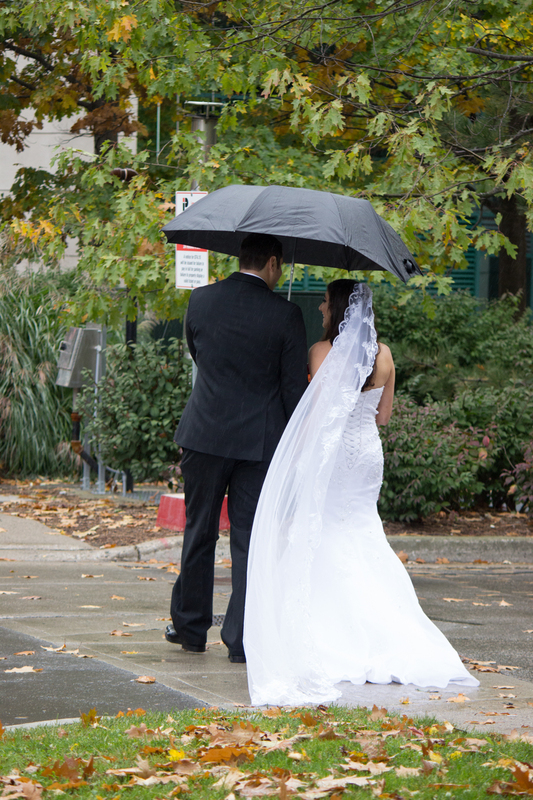 It seemed like an obvious thing to do because the couple specifically chose to have their wedding in fall. I had to stand a good distance back and use a long focal length to help crop out the busy background. The right image shows that the location itself wasn't perfect, but with a little creativity and good composition the image turned out dreamy. I captured this image while assisting Robert Russell Photography in London Ontario. I created this retro style, faded hazy look by holding a maple leaf very close to the lens and using a large aperture to create the out of focus blur (bokeh). I used the leaf to frame the couple just right and used a warmer white balance to set the tone. 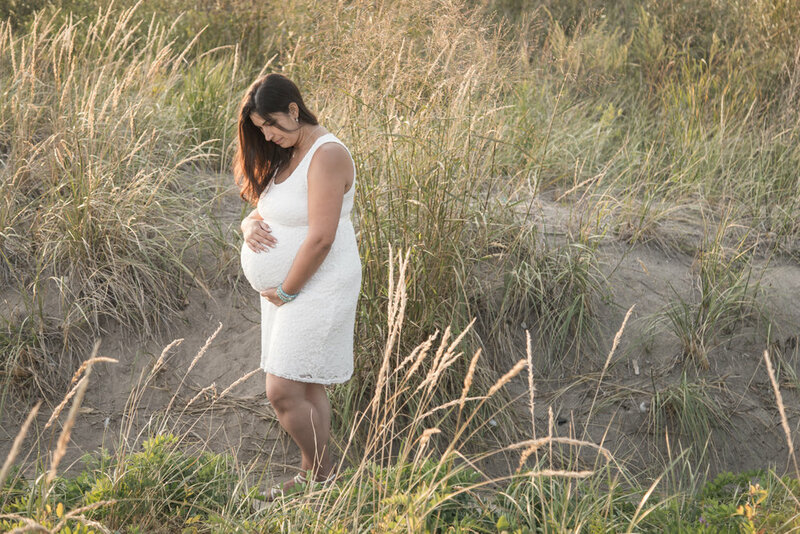 I captured this image while assisting Mark Requena Photography in Chatham Ontario. Earlier this year I took photos at the 16th annual show and was surprised by the number of vendors and the size of the show. Rob is a great host, the cost is very economical and the proceeds go to great places. If that is not enough to encourage you to check it out, hopefully the pics will. I have included all the info your convenience. Farm Toys, Trains, Sports Cards, Trucks, Construction, Model Ships, Books, Planes, Cars, Action Figures, Dolls, Collectibles, Coins and More! 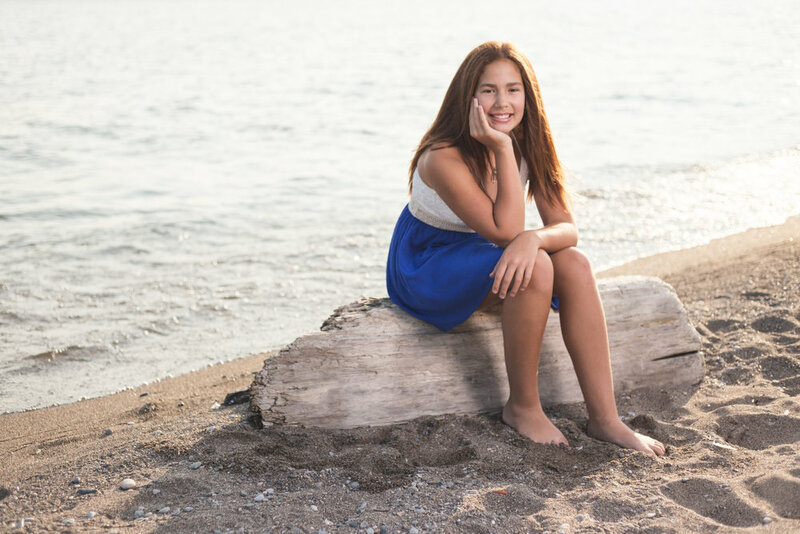 This was an absolutely beautiful, sunset photo session at Erieau beach. 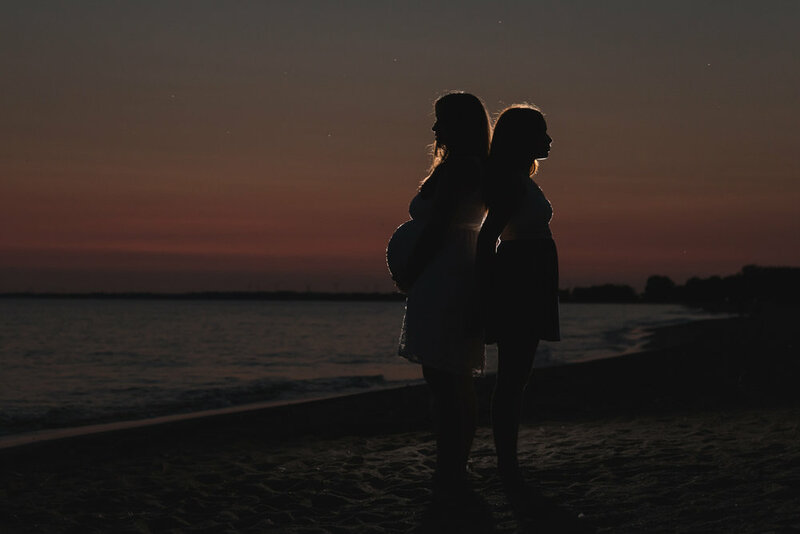 I had photographed Carolina & Sophia a few years ago and it is so wonderful to be able to see their family grow.